Minimum $1,000 per year award, with a three-year pledge paid yearly. Limited, specific criteria may be defined by donor. May be named as directed by the donor in their scholarship agreement. Minimum $2,000 donation paid once by the donor(s). Unless otherwise designated, scholarship gifts under $2,000 are directed to the RCC Rogue Hero Endowed Fund. This fund not only awards scholarships across all programs and majors to RCC students, but is also used for special projects to assist faculty, staff and students. 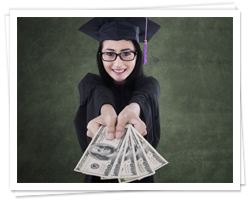 Donors may instruct that their funds be credited to an already established named annual scholarship or endowment. Endowments are established by the donor(s) with a $10,000 minimum gift. Limited specific criteria may be defined by the donor. May be named as directed by the donor in their endowment agreement. May be funded through current funds, stocks or an estate gift. Scholarship award amount is a percentage of the earnings set by the RCCF Investment Committee based on a three-year rolling average. Donor may take up to five years to build the endowment. Talk with Foundation staff for more information about the details of how to establish a scholarship or endowment fund. A 5% gift fee is assessed on all restricted funds given to the RCC Foundation.